The flagship CX8.90 is still the world’s highest-capacity conventional combine. This six-strawwalker, 490-hp model benefits from ECOBlue™ SCR technology for Tier 4A compliance and features a 355-bushel grain tank with remote operated covers. Compatible with the 40-ft 840CD and 880CF draper heads and the 41-foot Varifeed™ head, and available with IntelliSteer™ auto-guidance, the CX8.90 definitely allows you to harvest at the next level. The CX8 Series lighting package raises the lighting bar. The spread of light is precision engineered for maximum visibility of the entire head and the field ahead and behind. You can expect precision unloading in the dead of night. You’ll never lose a single grain thanks to a specific unloading auger light. You even have the choice of a full LED work light package and LED far distance lights to provide visibility up to 1,600 ft ahead. Another innovation from New Holland. • The standard wide cloth-trimmed seat provides exceptional features and ensures all operators will stay comfortable throughout the longest harvesting day. • The optional deluxe cloth-trimmed seat with heating and active ventilation is perfect for the hottest days and the coldest nights, and features fore/aft movement for even more comfort. • The top-of-the-line leather-trimmed seat features all the above as well as extended vertical travel and automatic weight adjustment that absorbs even the most severe bumps to offer the ultimate in operator comfort and style. The ultra-wide 10.4-inch IntelliView™ IV color touchscreen monitor is mounted on rollers which can move along an ideal viewing arc so you can position it just where you want. A second screen can be installed on request and is perfect for IntelliSteer™ auto guidance tasks or for displaying camera views. You can view up to three cameras on each monitor and one camera is pre- wired to assist with reversing. The Opti-Speed™ strawwalkers represent a ground-breaking harvesting advance and deliver up to 10% productivity improvements. 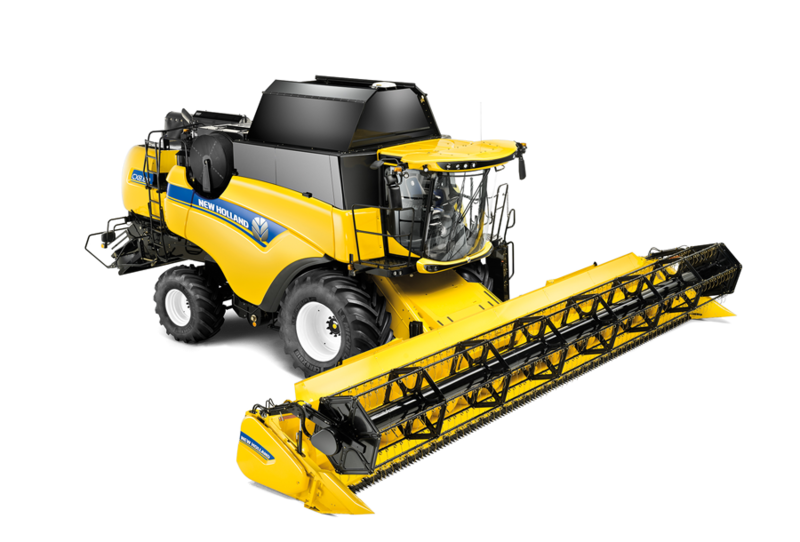 Unique in the industry, New Holland regulates strawwalker speed in respect to harvesting conditions. Simply select from four settings: wheat, corn, canola or rice, and your CX will automatically regulate strawwalker speed. When travelling uphill strawwalker speed automatically reduces to ensure all of the valuable grains remains safely inside the combine, and on downward gradients, the speed is increased to maintain efficient separation. The award winning Opti-Fan™ system is standard and compensates for the gravitational effects on crops during harvesting. Select the desired fan speed on flat ground and the system automatically adjusts it: when harvesting on upward slopes the fan slows down to prevent losses, and when tackling downhill gradients it increases the speed to maintain a perfectly clean grain sample. This efficient system requires no extra work from the operator and provides a better grain sample together with reduced losses. You can order your CX8 Series combine with fully integrated IntelliSteer™ auto guidance direct from the factory to start saving money from your first run. The IntelliSteer system is an integral part of the combine’s steering system and uses DGPS or RTK to help ensure parallel pass-to-pass accuracy as precise as +/- 1 inch. IntelliSteer benefits include less operator fatigue and full, more effective use of header cutting width, which leads to higher capacity every day. The IntelliSteer™ System uses built-in T3 terrain-compensated correction signals to keep the Navigation Controller II informed of the combine’s orientation (roll, pitch, yaw). An integrated control valve in the hydraulic system converts the signals from the Navigation Controller II into movements of the steering system. The New Holland 372 antenna receives both DGPS and GLONASS signals and is fully compatible with WAAS, OmniSTAR, or RTK correction. For RTK applications, a slim-profile radio is mounted underneath the receiver. The antenna is positioned on the top of the grain tank to improve signal reception and enhance operation. Use the standard IntelliView™ IV monitor to set up the optional IntelliSteer™ auto guidance system. You can program a variety of guidance paths, from straight A-B runs to complex adaptive curves. You can also personalize your settings and transfer information from your combine, direct to your precision farming software package. Corn heads are available with automatic row guidance to keep your CX8 Series combine perfectly on the row. Two sensors continuously monitor the position of the crop entering the head, and automatically guide the combine to ensure true perpendicular entry—even in poor visibility or at high speeds. The system can also be linked to a GPS positioning system, which can distinguish between cut and uncut rows, for night harvesting and advanced harvesting activities such as skip row functionality. New Holland offers a wide range of accuracy options, allowing you to select the right IntelliSteer™ system to match your needs and budget. When using RTK correction with the IntelliSteer system, you enjoy year-over-year repeatability. For the highest degree of accuracy, use an RTK base station that broadcasts a correction signal that allows you to achieve a pass-to-pass accuracy of +/- 1 inch. CX8 Series combines are engineered with precision farming features right at their heart. Yield information is continually updated and displayed on the IntelliView™ IV monitor. This data can be stored, downloaded and analyzed with precision farming software to establish accurate yields maps. These can be used to fine tune inputs to maximize yields and minimize input costs. New Holland’s moisture sensor measures grain moisture in real time. It takes samples every 30 seconds and sends the data to the IntelliView™ IV monitor. The operator is kept continually informed and can adapt machine parameters accordingly. New Holland’s exclusive, patented, high-accuracy yield sensor is generally recognized as best in class. Its design neutralizes the rubbing effect of grain. Whatever the kind, the variety or the moisture content of the kernel, the sensor generates an extremely accurate yield measurement. And, calibration is performed just once a season*, and the system then automatically adapts to changing crops and conditions. You get hands-off operation for ultimate harvesting simplicity. *Requires one-load calibration per crop types with significant yield variation. PLM® Connect enables you to connect to your combine and other equipment from the comfort of your office or on-the-go with a mobile device. You can stay in touch with your machines at all times, and you can even send and receive real-time information that saves time and enhances productivity. The entry-level PLM® Connect Essential package offers the most frequently used features or upgrade to the PLM® Connect Professional package for full machine monitoring and control. New Holland created the PLM portal to support New Holland customers who have purchased Precision Farming and Auto Guidance products. Available to all New Holland customers, visit www.newhollandplm.com today. Once you have signed in, you have unlimited access to the most advanced information on all New Holland Precision Farming and Auto Guidance systems. There is also a section dedicated to training videos and customer support information. New Holland offers a variety of precision farming packages which allow you to tailor your inputs to reduce your costs and increase your yields. This information is recorded in real time by your machine while working, and it is simply and efficiently transferred for analysis by the computer package from the IntelliView™ IV monitor via the complementary 4GB USB stick, which is large enough to record data from over 1500 – 1700 acres. * Developed by FPT Industrial. ** Biodiesel blend must fully comply with the latest fuel specification EN14214:2009 and operation is in accordance with operator manual guidelines. **** Traction wheels other than those mentioned are also available.